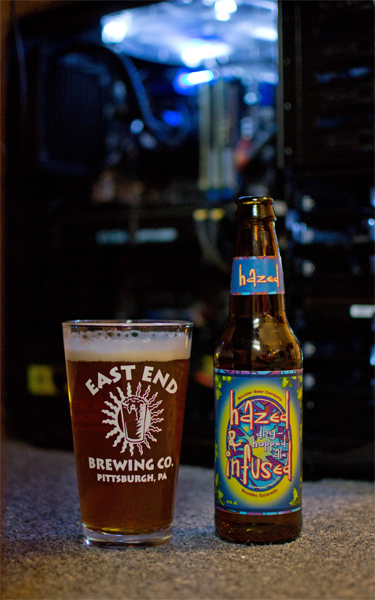 Beer #358 finds me swilling down something called Hazed & Infused by Boulder Beer Company from Boulder, Colorado. 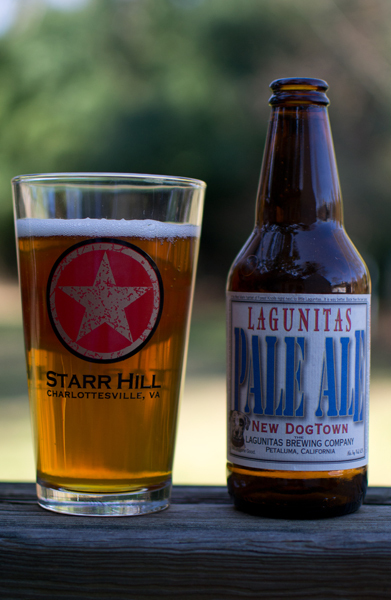 The ABV of this American Pale Ale comes in at 4.85%. It poured a nice golden amber color with a fluffy white head. Excellent lacing did that head leave behind. The nose was a bit on the light side with gentle aromas of citrus, some pine and soap. Yep soap. The taste was not soapy at all thank goodness. It had some nice hoppy, heavier flavors of orange, tangerine, and pine mixing with caramel malts. The body was fairly light, it had a gentle bitterness and with lower amount of carbonation that made this quite smooth. It was quite drinkable and was gone quite fast…quite. I hate being sick…nothing tastes right or smells good. So this will be another non-review but I will drink it…it shouldn’t react with DayQuil or Zicam right…right??? 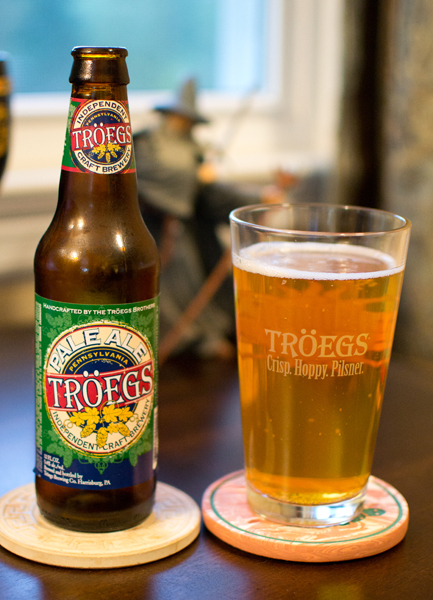 Beer #349 is Pale Ale by Troegs Brewing Company from Harrisburg, Pennsylvania. This is an American Pale Ale with an ABV of 5.4%. I poured it, I drank it. I happened to glance at the night sky on my way home tonight…the moon was out and it looked beautiful. It was full and there were clouds partially blocking it…it was quite a sight. On to beer #347. 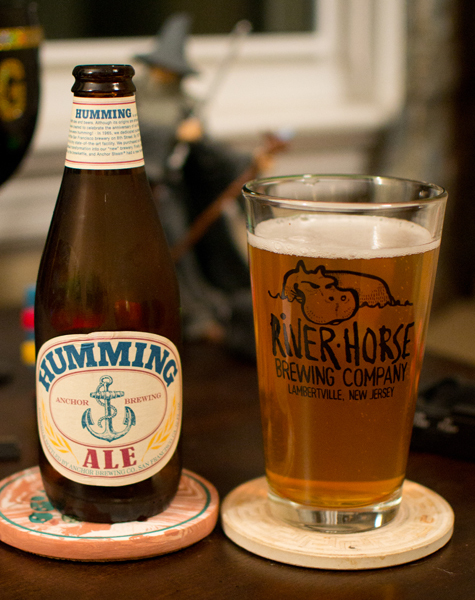 Humming Ale by Anchor Brewing Company is brewed in San Fransisco, California. Anchor has been brewing this American Pale since 2009. The ABV comes in nicely at 5.9%. Appearance – Clear golden with tiny white head. Nose – All hops…grapefruit, oranges, & earthy. Taste – Ahh…there are the malts giving it a nice bready flavor and the citrus, grapefruit in particular, were evident in this lightly bitter brew. Mouthfeel – Medium body, lively stinging carbonation. It was quite crisp. Very refreshing. Overall – Solid beer that was refreshing and easy to drink. From Philly we find ourselves just slightly north back in to the old Garden State, New Jersey. 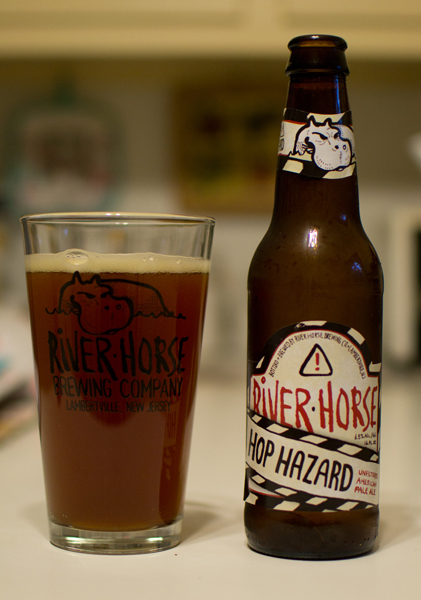 Lambertville is the town and River Horse Brewing Company provides us with beer #344, Hop Hazard. This is an American Pale Ale with an ABV of 6.5%. I actually have a River Horse glass for the pour and into that glass went a dark, murky amber colored brew with just a small off-white head. 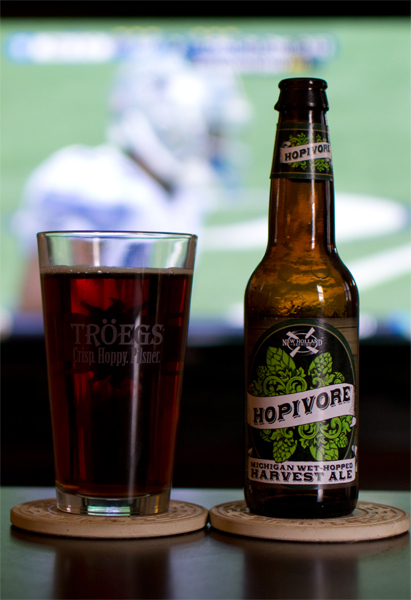 The nose was a decent mix of caramel malts and a hoppy pine scent and an aroma very similar to tea…odd. It tasted just like it smelled with the addition of a bit of white grapefruit both in flavor and bitterness. I thought the hops were a bit more noticeable in the flavor…the pine in particular…than the malts. The carbonation was average in this medium bodied brew. It was a fairly smooth beer that I finished really quick. This was a solid beer from River Horse and one more beer for me in the long line towards 365. Beer #330 is Stone Pale Ale from Stone Brewing Company. Escondido, California is where this American Pale Ale is brewed and it is brewed with an ABV of 5.4%. 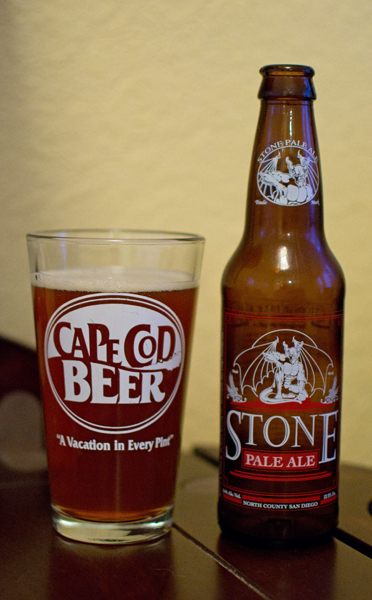 I am generally a fan of Stone, so let us see how this beer fares. Appearance – Amber color with a trace amount of a white head. Nose – A bit more maltier than I was expecting with nice strong notes of caramel and bread. The hops were there also but in a subdued way with some faint grapefruit aromas. Taste – The malts are up front here with a slightly sweet bread like flavor. Then the hops come on, much more pronounced then in the nose, with a nice, and for a Stone brew, not overly bitter grapefruit taste. Definitely more malty than hoppy. It had a nice crisp finish to it. Mouthfeel – Medium bodied with moderate amounts of carbonation make this quite drinkable. Overall – A very, very good beer from Stone. I could see this being a nice session brew for football Sundays. I may have to pick myself up a six pack of this for just that reason to break away from my usual, much more citrus and hoppy, American IPAs.